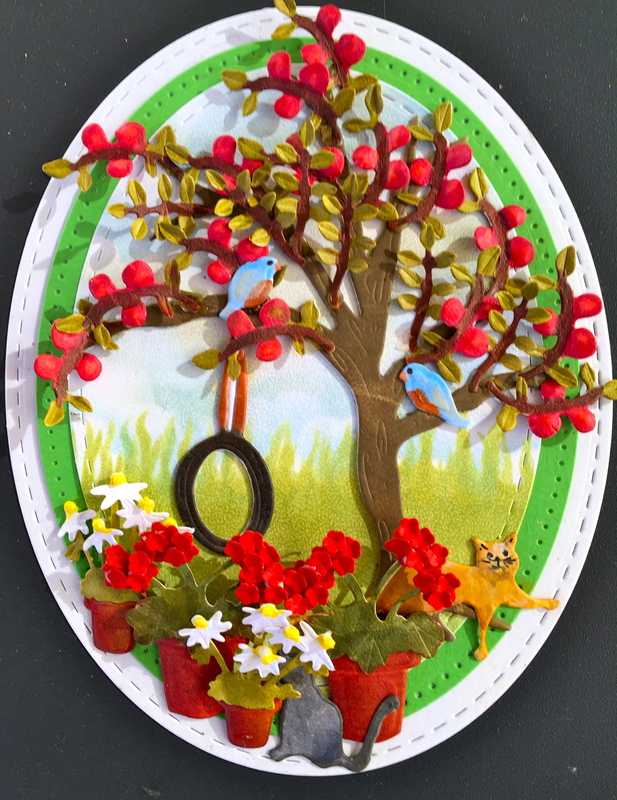 I die cut the same apple tree, but this time also included the branches with the apple clusters on them, the tire swing, two large and two small flower pots, two of my cats, and some birds. Assemble the Stitched Ovals as in Steps Two and Three of the previous day. I added a little of the PanPastel Set 2/Permanent Green Shade to the grass to show the changes with the temperatures rising. 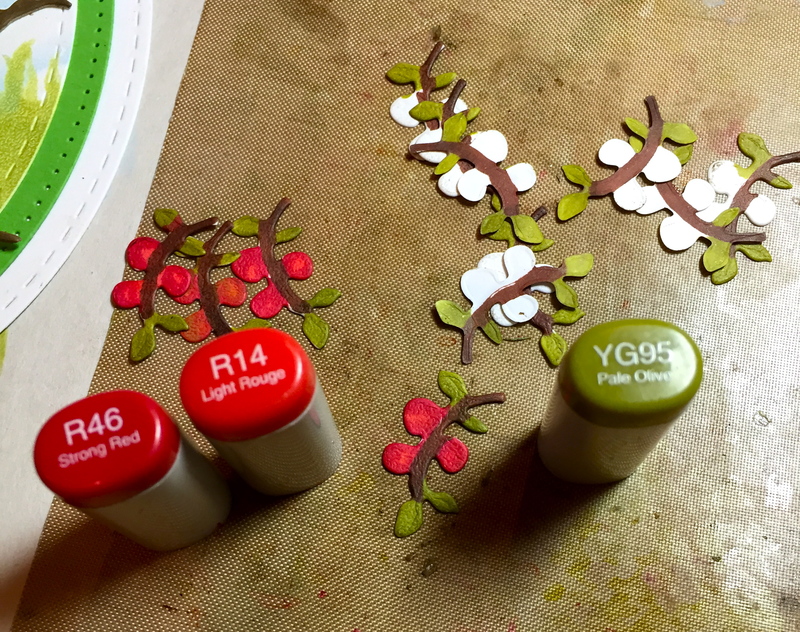 Coloring the branches (right & wrong sides) is easy using Copic Markers–R14, R46, YG95, and E29 for the branch. 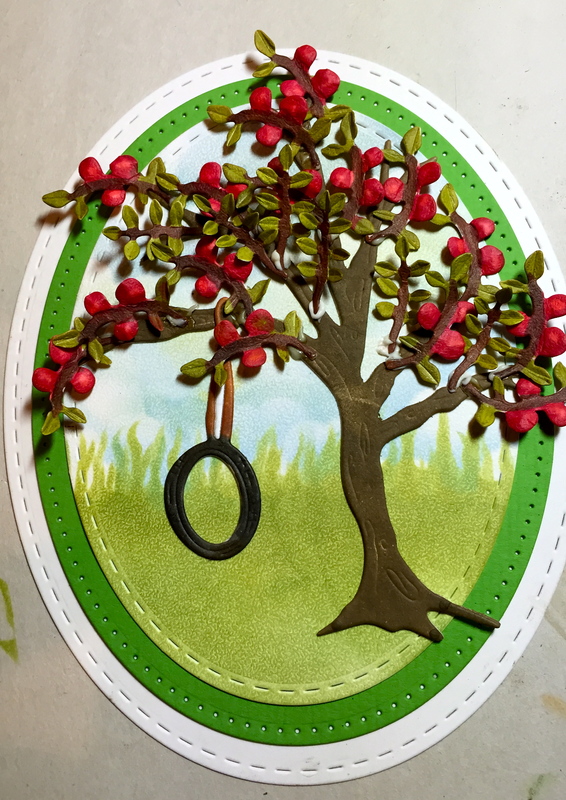 In addition to placing the branch on the Leaf Pad to add a stem line down the center of the leaf, I also place the branch, right-side-down on the Molding Pad and use the small ball Stylus to add some dimension to the apples. Place branches on the tree, adding some branches that are only have leaves. 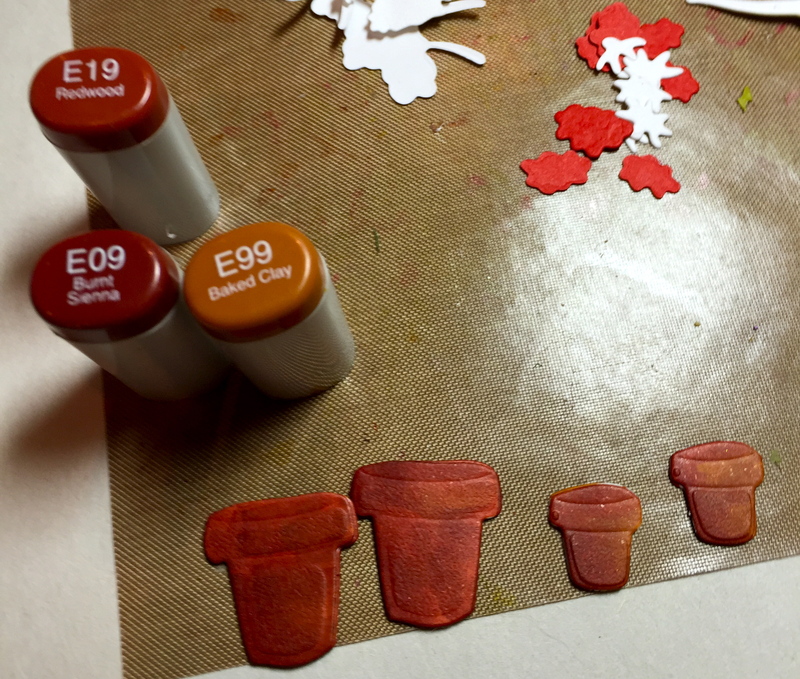 I die cut the flower pots twice in each size, with Clear Double sided Adhesive on the back. Adhere the like pieces together and shade with Copic Markers E19, E09, and E99. Die cut the cats in Soft Finish 85 lb white card stock with Double sided Adhesive on the back. Color the Cats–our Harper is a Buff and Clara is part Russian Blue. Place the “laying cat” down first before adding the flower pots. I die cut the Geranium leaves in Soft Finish White 85 lb card stock and use Copic Markers in G99 to color. 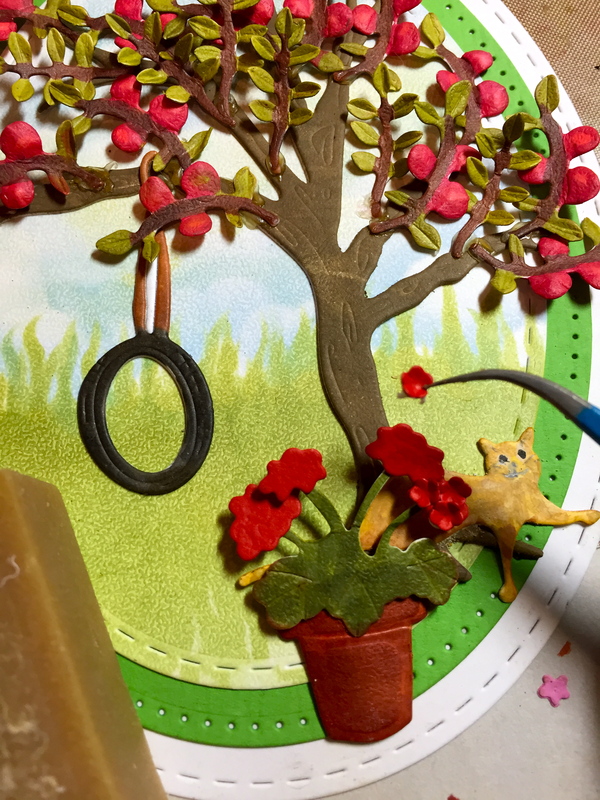 I die cut the “heads” and of the Geranium and individual Petals in Premium Palette/Ladybug card stock. Glue the heads to the stems, then place the individual petals on a molding pad and cup using the small ball stylus. 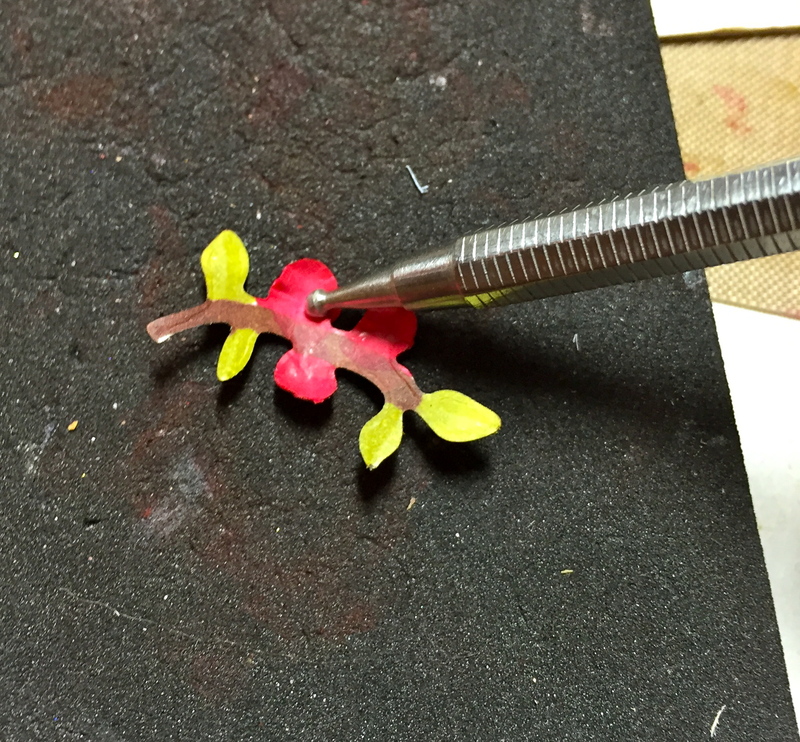 Pick up the individual petals and glue to the heads. I die cut the Daisy stems and Flowers in Soft Finish White 85 lb card stock. Color the stems with Copic Marker YG95. Leaves Daisies white, but color the center with Copic Y13. I also placed a Prill/Go Man Go in the center of each Daisy for dimension. Finally, I die cut two birds in Soft Finish White 85 lb. card stock and colored them with Copic B21, B32, and E19 to resemble a Blue Bird. Oh Susan, you are making me remember such beautiful memories with your cards. This one reminds me my neighbor’s tree. 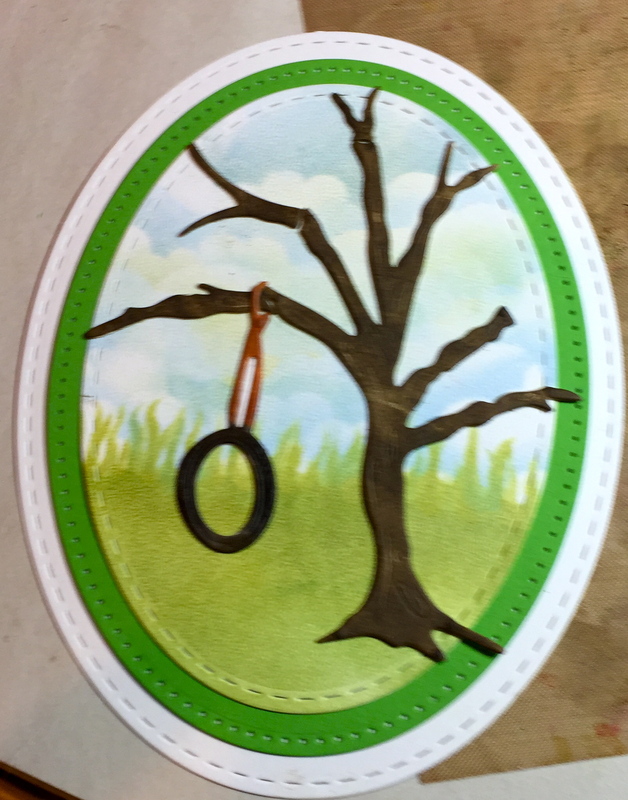 They are very nice people and when they realized that I couldn’t stop looking at their tree with the wheel, they invited me to play. They told me that they built it for their children but now they are all in the university so I was more than welcome to play there. I must confess that I love it!! and I enjoy spending time with them and learning gardening with them.